I was so excited to be asked to be the Guest Designer over at Sweet Stamping Challenge Blog for the month of February! What an honor!! It's a great challenge and I hope you'll stop by and see all the wonderful inspiration from the DT and play along in the challenge this week. The theme is Valentine's and what could be easier and more fun for right now with Valentine's Day fast approaching!! By entering you'll have a chance of winning a great prize package from the sponsor Crafter's Companion. I went with some very non traditional colors for this Valentine's card that will be going to one of Jim's grandsons. 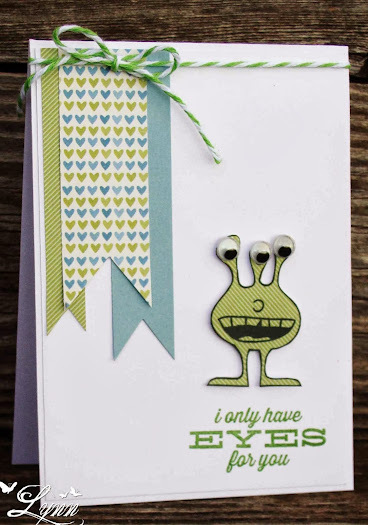 The monster stamp and sentiment are from Simon Says Stamp and were included in one of the monthly card kits. For the banners and paper piecing on this little guy I just used some scraps I had on hand. Of course no little monster would be complete with those googly eyes! I'm really thinking I love this little guys green teeth and tongue too! I'll enter this in the challenges at Pixie's Crafty Workshop (snippets for the banners and paper piecing the monster). Love this one Lynn. The eyes are an absolute bulls eye or eyes. Smile. Jim's grandson with get such a big kick out of this one. It's precious, Lynn. Absolutely fun and fantastic card Lynn! Love the papers you used to complement the handsome monster! Fabulous Valentine's card! Love the googly eyes too. Congratulations on the Guest GDT Lynn. I do love your card and the googly eyes on the little monster are wonderful. I love it when I see one of your humor cards. How to say it's pretty and so darn cute at the same time! Love the colors too! Congratulations on your DT spot..
What a FABulous image and sentiment this is...LOve it. Buuwuwaawaahahahahah!!!! This is fabulous, fun, and funky! Awesome!!! Well the eyes definitely have it on this card! I love the colors, banners, and of course that little monster! Congrats on the GT spot! Congratulations on the honor, Lynn! It's a special honor for them, too!! This makes me so happy it's indecent! Best valentine monstah ever! Love those green teeth - so awesome for a boy card, lol! This card made me smile and I love this three eyed creature. Sure he is all eyes. Very unusual card for Valentine's. Hope you and Jim are well. hahahahha.. this is so stinkin' cute and I LOVE it! The saying is so perfect for those silly eyes! OOps..nearly forgot to say Congrats on being asked to take on another DT assignment. Wow! Loving that googlie eyed image, and the perfect sentiment to go along with it! Darling card. Congrats on the guest DT for the month spot! This card gave me a chuckle--how fun is it. It is a great use of snippets. I'm loving the colors and the google eyes. Oh what a cute little monster, I love the googly eyes and the banners! A big congrats on your GDT spot, Lynn! Congrats on your GDT gig, Lynn....you are sooo deserving!!! Your card is just tooo cute...gotta love that adorable little monster!!! Your DGS will love it, too!!! Love it! Great design, colours and monster- brilliant! Even more cute wiggle eyes!!!! I'm not sure what I like more-the fun alien/monster or the fabulous banners! !